Our thanks to Robert Coles and Ralph Warfield who provided their photographs to supplement those we took this year. This year we had a lot more advanced publicity in the media because it was the 70th anniversary, and more people were there than in previous years. Also 1st Take had a camera there because they intend to update their product "Bath at War". 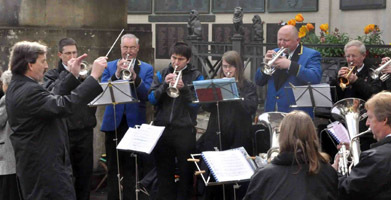 There were TV cameras from ITV, who broadcast a snippet from the service in the evening bulletin of local news; and from the BBC who recorded and broadcast an interview with one of the organisers. 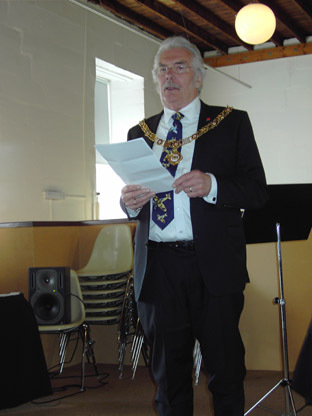 The Mayor of Bath attended but did not take an active part in the service. 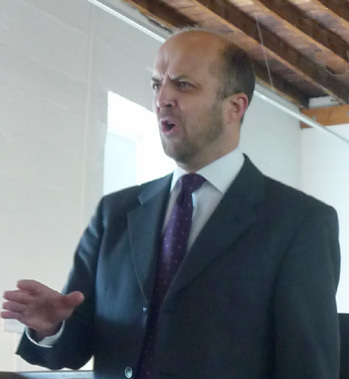 He was due to speak at the event at the Museum of Bath at Work which would follow the service. However, the Mayor did mingle with and chat to the the members of the public near him. .Because of the number of people attending, which meant that some of them were a long way away from the presenters, we used microphones this year. 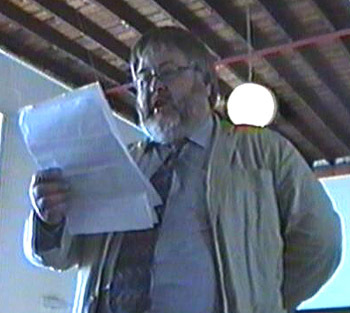 Brian Vowles, the Chairman of the Project welcomed everybody and gave a few words of introduction. For copyright reasons we cannot reproduce the text of the poem here. 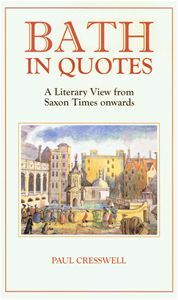 For those who want to read it for themselves, it can be found in the book "Bath In Quotes". Prayers were then offered for the victims of the Bath Blitz: for those who suffered yet survived, for those who died, and for their families and friends who mourn them. The story of Alan Reid. 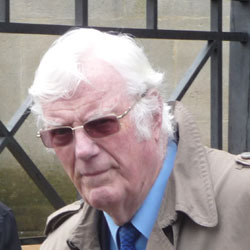 John Penny told the story of Alan Reid, a schoolboy from London visiting his Grandmother in Bath at the time of the Bath blitz. Molly is the Head Girl of St Mark's School, and she laid a wreath in memory of the ordinary citizens killed in the Bath Blitz. St Mark's School kindly donated the wreath. ATC Cadet Oliver Hemming laid a wreath in memory of those civilians killed in the course of their duties. These included the Police, the Fire Service, the Home Guard among the uniformed civilians, and the Civil Defence Volunteers who provided First Aid, Fire Watching, Air Raid Precautions, Messenger and numerous other services. Joining Oliver in the respectful salute after the wreath was laid was Army Cadet Toby Symonds. 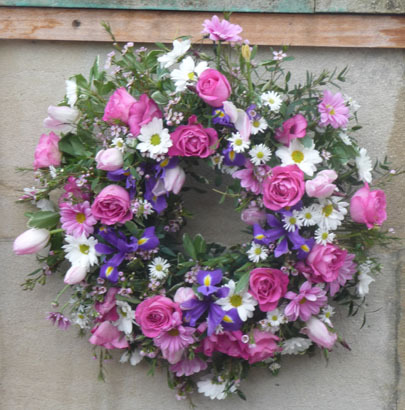 The second wreath was kindly donated by the Bus Station Florists in Widcombe. 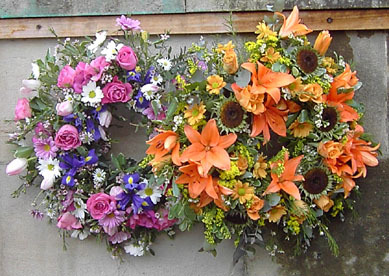 It is understood that St Mark's School also obtained their wreath from the same florist. The fact that the same florist could provide two distinctly different but high quality wreaths is very much appreciated. Click here for information about the plans for the 2013 ceremony. 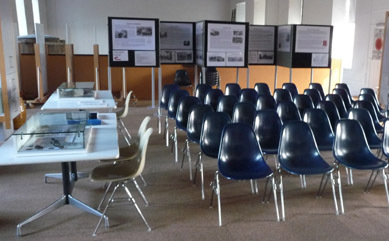 Up until this year the Bath Blitz Memorial Project has provided its old A0 sized exhibition material which was originally prepared for the 60th anniversary. Over the intervening 10 years it had become worn, marked, and in some cases outdated. It had also been on occasions a problematic size, being a difficult fit on some display panels, including those available at the Museum of Bath at Work. Thanks to the Oldfield Ward Councillors who generously offered some funding from their Ward Councillor's Initiative budget, some donations, and a guarantor to cover any residual shortfall (which in the event was not needed), 40 new A1 sized exhibition boards had been designed, printed and laminated (for longevity) especially for the 70th Anniversary. In the exhibition space on the top floor of the Museum of Bath at Work were just 20 of the A1 exhibits, in order to leave room for a seated audience alongside the cabinets of physical relics of the war on loan from their owners. 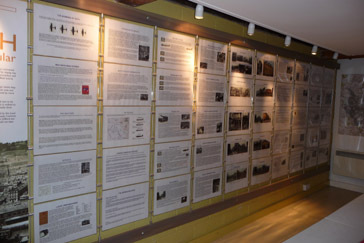 With the assistance of the staff in the Mayor of Bath's office, the content of the A1 exhibition boards was reduced to A3 which once printed was mounted in the Hudson Room, near the entrance of the Museum. Thus the complete set of exhibits was available to the public but in two different sizes spread over two display spaces. 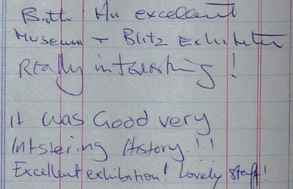 These exhibits had been available to all visitors to the Museum since the beginning of April (and had proved popular, as we were informed and the pages of the Museum Visitor's Book confirmed) and therefore the timetable for those arriving at the Museum from the service allowed an interval for refreshments and browsing before the programmed events started. 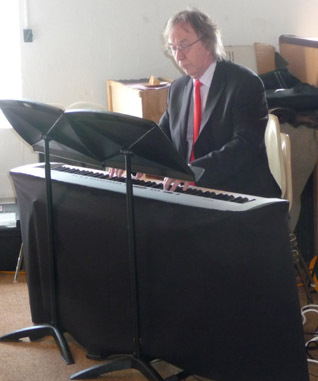 Peter Blackwood played the piano in the background as those attending took refreshments, enjoyed the exhibits and generally mingled. Nick Burgess opened the event formally by welcoming everybody and then introducing the Mayor of Bath. "My apologies for being unable to attend this unique event today. I am sure it is quite an occasion and a fitting memorial to those that lived, and died, during the Bath Blitz. It's Commemoration has come a long way. When I first did research on the topic, as a callow 6th former from King Edward's School in 1975 for an A Level project, the main records of the Blitz were kept in the Guildhall in a series of what looked like shoe boxes and in the main corridor outside the Records room. As to actual memorials there were very few. There were a very few plaques: a small one in Queen Square, and references to individual incidents such as at the Gas Works and a few other places, and nothing else. There were still gaps in roads where bombs had fallen - New King Street, Wellsway - and the open ground opposite the Scala supermarket in Oldfield Park was fenced off grass and nothing else. When my project grew into a book in the early 1980s I concluded that we were in danger of forgetting the whole incident and that the victims deserved better. I am glad to say that my worries proved unfounded. 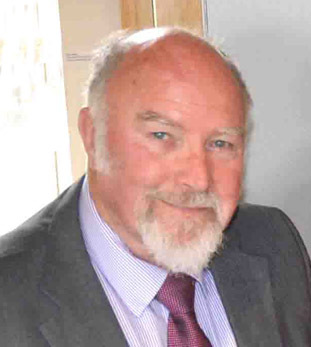 Sterling work by Jim Warren and others has led to the names of the dead being added to an official war memorial, a further memorial in Oldfield Park, annual commemorations and a website that is one of the best that there is devoted to a city's Blitz. My best wishes to all and congratulations to such an event as this. 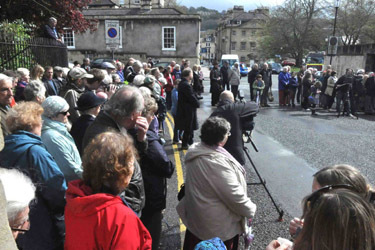 The mayor continued with an outline of his Mayor's Theme of Industrial Heritage, and pointed out the connection with the wartime industries and the Bath blitz, and he thanked us for the contribution the Project made to his Heritage Days. "I know today is the anniversary of the 70 years since the blitz on Bath, and I would have so much liked to have been able to be there to commemorate the event with the remaining survivors and their family, but due to the constraints of work and study here in Finland, this has not been possible. If you would, please extend my best wishes to all those who remember me and how the project began and the collective effort which has bore its fruit in many good ways bringing healing and reconciliation to many. I hope to be able to visit Bath again in the future and when I do, I would like to meet if you are free, and also perhaps some of the other project members too. 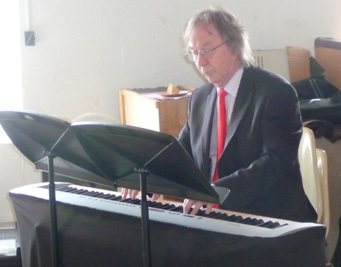 The audience were treated to a session of Geoff White singing to the accompaniment of Peter Blackwood. Many old-time favourites were included, among which were Underneath The Arches, Bless 'Em All, Run Rabbit Run, Roll Out The Barrel, White Cliffs Of Dover and several others. Audience participation was inevitable (and encouraged). 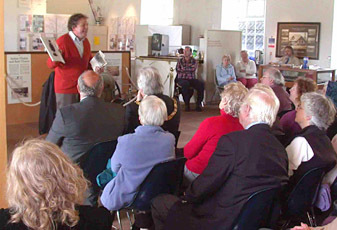 Martin Wainwright, the author of the book "The Bath Blitz" was introduced by Brian Vowles. 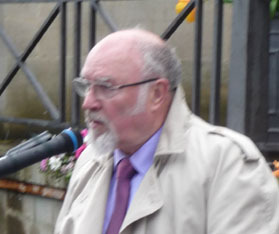 Martin gave an entertaining and wide ranging speech. It is not possible to reproduce it here, but if we report that it made references to journalism, The Pavilion, the IRA, Lord Asquith, Vera Lynn, Bath's Labour Exchange, Lady Hamilton, the blackout, childhood, Leeds, delphiniums, the Sack Of Bath, the Chronicle, and Cyril Beazer as well as the Bath Blitz, then some impression of the range of ideas can be provided. 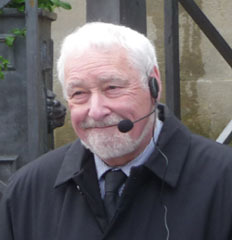 Brian Vowles gave a vote of thanks to the organisers and participants. Project members mingled with and chatted to those enjoying the exhibits until it was time to leave. Martin left some copies of his book "The Bath Blitz" with the museum for sale to the public. The Project similarly left copies of its first video, now converted to DVD, with the museum for sale to the public. The 417 people who died in the Bath Blitz have been remembered in a 70th anniversary service at the city's Royal Victoria Park. Bombing raids on April 25-27, 1942, left more than 400 people dead and caused terrible damage, with churches and whole streets destroyed. 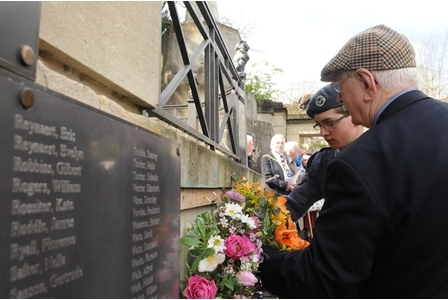 The annual service, organised by the Bath Blitz Memorial Project, drew not only survivors and descendants of those killed but also representatives from emergency services. One survivor, Pat Connett, represented the Home Guard at the service. Her father John was among those guarding the water tower at Lansdown in April 1942. The WRVS was represented by Doreen Williams, the main organiser of the service. A wreath in memory of all the 390 civilians who died was laid, as well as one to commemorate volunteers. 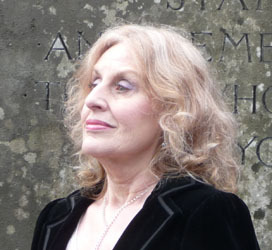 A poem, "The Bombed City", was read out by Kathryn Pond-Barrett, before prayers and a minute's silence. 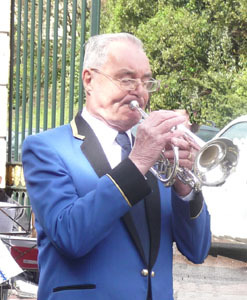 The Last Post and other musical tributes were played by members of the Bath Spa Band. People from all generations attended a special memorial service in Royal Victoria Park yesterday to mark the 70th anniversary of the Bath Blitz. Bombing raids by the German Luftwaffe on the nights of April 25, 26 and 27 1942 left more than 400 people dead and caused terrible damage to the city’s Georgian architecture, with churches and whole streets destroyed. The annual service at the park’s war memorial is organised by the Bath Blitz Memorial Project, and brought together not only survivors and descendants of those killed but also representatives from emergency services, including police, firefighters and St John Ambulance. One survivor of the raids, Pat Connett, represented the Home Guard at the service. Her father John was among those guarding the water tower at Lansdown in April 1942. 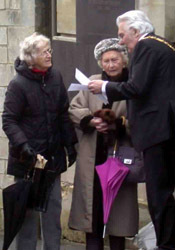 The Women’s Voluntary Service was represented by Doreen Williams, the main organiser of the service. Her mother Florence was a WVS member in charge of 200 volunteers running the forces canteen in Bath, where they issued blankets, hot tea and other comforts to bombed-out families. Mrs Williams’s father, Leonard Smith, served as a part-time fireman and was off duty when the raids started, but went out to help his comrades and was killed instantly by a bomb while pumping water at the Circus. Now in her 80s, she was just 15 when her father became the only firefighter to die in the Bath Blitz. The civil defence volunteers and messengers were represented at the service by 82-year-old Harry Hemming, from Oldfield Park. His wife Eileen lost four members of her family when a bomb hit their house at Snow Hill on the Monday of the attacks. A wreath in memory of all the 390 civilians who died was laid by Molly Crane, head girl of St Mark’s School. 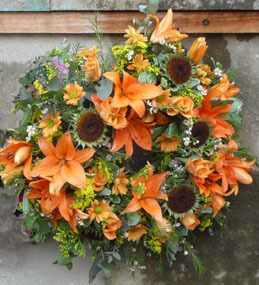 In addition, for this special anniversary, there was a second wreath to commemorate the volunteers who lost their lives. 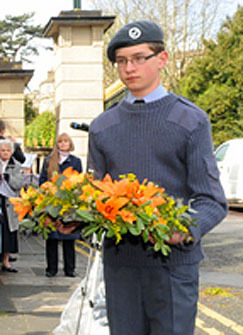 It was laid by Mr Hemming’s grandson, 14-year-old Oliver, who is an ATC cadet. 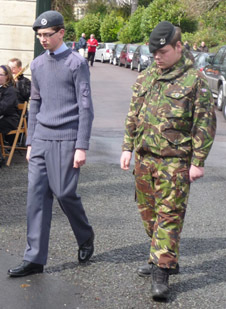 He was accompanied by an Army cadet, Toby Symonds. Oliver said afterwards: "I feel really proud to be representing my family, my grandfather and the air cadets. I didn’t know much about what happened to my family in the bombings until recently and this service has brought it all home to me even more." 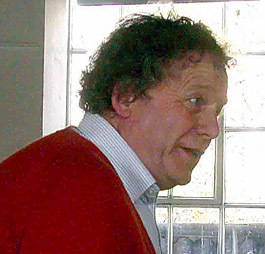 Oliver’s father Roger added: "I never knew any of my mother’s family because they were all killed. It’s amazing and fantastic to have three generations of us all here today to remember them." Heavy showers relented long enough for the service to take place in sunshine. A poem, 'The Bombed City', was read out by Kathryn Pond-Barrett, before prayers and a minute’s silence to remember all 417 people who lost their lives. 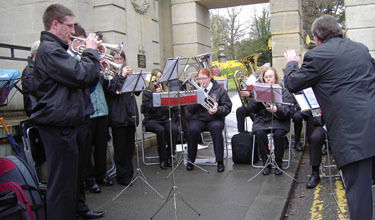 The Last Post and other musical tributes were played by members of the Bath Spa Band. Those attending included Wendy Preece, who travelled from Leicester for the occasion. 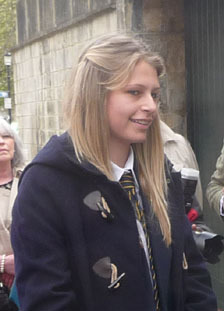 Her grandfather Seymour Buckingham worked for the Admiralty in Bath and was killed by a bomb falling on his home in Victoria Terrace. Wendy said: "I was born in 1945, three years after my grandfather’s death, so I never knew him. I’ve visited his grave in Haycombe Cemetery many times, but had never been to the memorial service. Then I saw on the Bath Blitz Memorial Project website that it was the 70th anniversary service and I just had to come. Today has been really poignant for me." It is 70 years since a series of terrifying raids were inflicted on the mostly undefended city of Bath. Today, visitors and residents alike are shocked to learn that Bath was bombed. Although now restored, on close inspection evidence of the devastation can be found – shrapnel scars and scorch marks on heritage buildings and, equally, the areas of "packing case" architecture of the 1960s and 1970s that filled those left derelict as a consequence of post-war building blight. In March 1942, Britain's Bomber Command, as part of a new policy of "area bombing", achieved its first successful attack on a German city. Their prey, the mostly undefended north German port of Lübeck. Britain had been unable to match the Luftwaffe's strength but until 1942 both sides had attacked legitimate military targets. Lübeck did manufacture armaments and the port was used for supplying the German armies in Northern Russia. These industrial areas, however, were far from the tightly packed medieval city centre where the RAF offensive resulted in extensive damage. Although Lübeck was a "soft" target, its destruction boosted Allied morale and seriously hurt the German High Command. As a direct consequence, over the weekend of April 25-27, 1942, Bath suffered three horrifying reprisal raids. Eighty Luftwaffe planes took off from Nazi-occupied northern France on a moonlit night. As the sirens wailed, few people took cover; even when the first pathfinder flares fell the people of Bath still believed the attack was destined for Bristol. During the first four months of that year, Bristol had been hit almost every night. It would be unfair to suggest that the people of Bath were blasé, but it is understandable that they really did not expect the bombs to fall on them. The first raid struck just before 11pm on the Saturday and lasted until 1am. Fear of further raids forced people to literally take to the hills, in what was known as "trekking". It is estimated that 10,000 people left the city during and immediately after the raids. Many slept under the stars within close proximity to Bath at Sally in the Woods, and Bathampton Rocks. Officials, however, required people to stay home. There was a real threat that if houses were unoccupied, fires from incendiaries could take hold rather than being quickly snuffed out and made safe. In the meantime, enemy aircraft had returned to France; refuelled, rearmed and returned at 4.35am. Bath was still ablaze from the first raid, making it easier for the German bombers to pick out their targets. The third raid, which only lasted two hours but caused extensive damage, arrived in the early hours of Monday morning. The bombers flew low to drop their high explosives and incendiaries and then returned to rain the streets with machine-gun fire. Their purpose was to terrorise and thereby hamper any attempts to put out the fires or make safe the incendiaries. Harry Patch, of Combe Down and the last surviving "Tommy" from the First World War, spent the Second World War as a member of the Auxiliary Fire Service. While working on the Wellsway during the blitz, Mr Patch and his crew were machine gunned as they tried to douse the flames created by the illumination flares. He wrote that the raids on Bath were so horrific that they reminded him of his time in Ypres in 1917. The Bath blitz killed 417 people and injured another 1,000. All loss of life is deplorable, but knowing that at least 50 people were killed when public air-raid shelters were hit is heart breaking. More than 19,000 buildings were affected, of which 1,100 were seriously damaged or destroyed including 218 of architectural or historic interest. The loss of the Assembly Rooms was recorded as one of Britain's chief cultural wartime losses and evidence of the intense heat can still be seen in the scorched pink stonework surrounding the windows to the left of the entrance. People's homes, places of work and transportation obviously took priority on the repair lists and thus the restoration of the Assembly Rooms was not completed until 1963. St Bartholomew's in Oldfield Park has the misfortune to be known as the unluckiest church in Bath. In November 1936, the foundation stone for this new church, designed by A Taylor, was laid. It had taken 34 years to raise the money for the scheme, the balance of which was financed with a bank loan. Fundraising efforts ensured that the mortgage was eventually paid off on March 15, 1942 – St Bartholomew's was finally debt free. Six weeks later, the church suffered a direct hit from a high explosive during the second raid. The destruction to the church was catastrophic, and very little remained structurally sound. The Luftwaffe targeted churches to undermine civilian morale and, perhaps in defiance, services continued to be held within the ruins of the church. 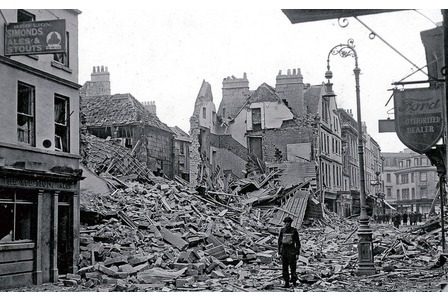 Along with the attacks on Exeter, York, Canterbury, and Norwich, the raids on Bath have become known as the Baedeker Blitz. The term originated with Baron Gustav Braun von Stumm, deputy head of the German foreign press division. He broadcast that the Luftwaffe had been instructed to attack every building rated highly in the well-known travel guides published by the firm of Karl Baedeker. Although Goebbels was reputedly furious with von Stumm for openly admitting that the Nazi's had adopted a policy of bombing cultural and historic targets, this announcement spread quickly and brought terror to Britain. The cities of the Baedecker raids were never legitimate military targets, but the raids created a momentum of fear because now no where was safe from enemy air attack. The people of Bath were sitting targets. Survivors believed that Bath was finished and could never recover. A German journalist reported that the Lutfwaffe had truly shown their strength; that the terrible raids of destruction and "fire of annihilation" would go down in history. In reality Bathonions would not allow their spirits to be broken. Through a mixture of stubborn denial, public morale and Government censorship the blitz on Bath was widely forgotten. And, until 2003, there was no city centre memorial to the hundreds of civilians who had lost their lives. On this the 70th anniversary of the Bath Blitz there are a number of commemorative events taking place including exhibitions at Bath at Work Museum and the Building of Bath Collection. The exhibition at Bath Central Library (April 16-28) will showcase a number of the photographs featured in a new publication from The History Press: Bath in the Blitz: Then and Now by Cathryn Spence and Dan Brown.